Two intrepid Michigan men returned from Alaska earlier this month, on a scouting mission in preparation for a June expedition to retrieve the remains of a North American B-25 Mitchell bomber that has been sitting on a sandbar on the Tanana River, near Fairbanks for the past 44 years. 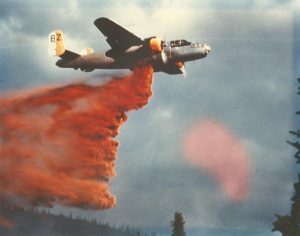 The Mitchell, built in 1944 and surplussed by the United States Army Air Force in 1959 had be re-purposed as a fire bomber and was fighting the Manley Hot Springs fire in 1969 when it met its untimely end. The plane had just taken off from Fairbanks International Airport with a load of fire retardant when both engines quit, purportedly from fuel contamination. 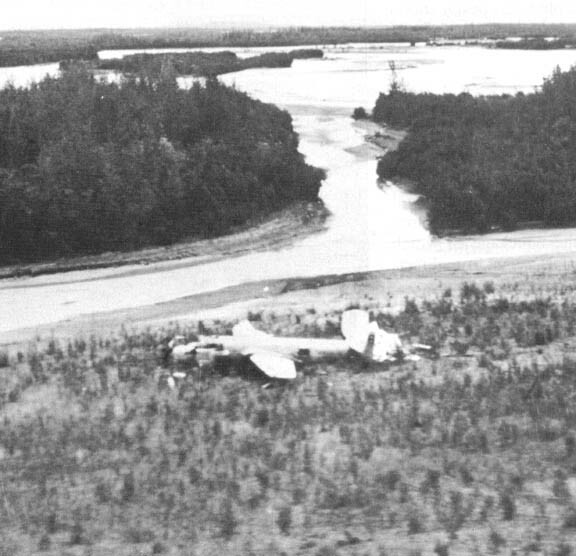 Rather than risk a water landing, or worse yet coming down in the forest, the pilot landed the plane gear-up on a sand bar in the Tanana River and while he managed to walk away from the forced landing, the front fuselage and right wing were damaged and the plane was considered a total loss. The Mitchell, stripped and abandoned in place, date unknown. The owner hired a salvage crew to remove the engines, propellers, wheels and any other items of value and the remainder was abandoned in place in the Alaskan wilderness. Over the course of the intervening decades, the plane has been picked over by vandals and/or scavengers and appears to have been fairly extensively shot at, but the dry, salt-free climate of the Alaskan interior has otherwise been kind to the craft. The June retrieval expedition, for which they are soliciting volunteers, will see their crew disassemble the airframe and fit the pieces to sleds for removal during the winter after the river has frozen over, though they are still holding out hope that they’ll find someone willing to airlift it to Fairbanks. Once in Fairbanks, the plane will be shipped overland to Michigan for the real work to begin. They are seeking donations for this ambitious rescue and restoration effort. More information is available at www.sandbarmitchell.org or you can visit them at their Facebook page.